Transport of goods is one of the reasons for the climbing economy. The methods of transporting cargo have evolved with the progressive nature of technology. Transport trucks remain the backbone of this industry. Roadways are by far the most dependable and cost-effective way to transport goods from one place to another. Trucks have been around for a long time. Trucks vary greatly in size, power and configuration, with the smallest being mechanically similar to a car. Depending on the requirement, custom parts and other changes have to be made to the truck so that it can be made dependable to carry the necessary load. Cab:The cab is the front portion of the truck where the driver sits. A sleeper is a compartment attached to the cab where the driver can take a break from driving. The cab is equipped with mostly all that a driver requires during his journey so that he doesn’t have to leave the cab for anything. 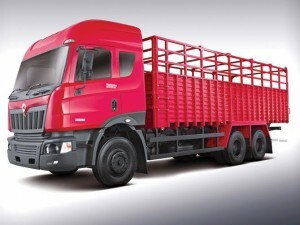 The cabins for Mahindra Navistar trucks can be customised to have single sleeper or double sleeper options. Engine:The oldest truck was built in 1896 by Gottlieb Daimler. Most small trucks such as sport utility vehicles (SUVs) or pickups, and even light medium-duty trucks throughout the world use petrol but many diesel engined models are equally popular. Most heavier trucks use four stroke diesel engine with a turbocharger and after-cooler. Diesel engines are becoming the engine of choice for trucks as seen in MN 25 which uses the MaxxForce 7.2 Engine. This engine is a 7.2 litre in-line six cylinder diesel engine. It has a 4-valve per cylinder technology and features both a mechanical injection system with a Bosch Rotary pump, as well as a high-pressure 1800 bar common rail fuel injection system. The MaxxForce 7.2 diesel engine to be produced in India is also fully compliant with BS III and BS IV emissions standards. Small trucks use the same type of transmissions as almost all cars, having either an automatic transmission or a manual transmission with synchromesh (synchronizers). Bigger trucks often use manual transmissions without synchronizers, saving bulk and weight, although synchromesh transmissions are used in larger trucks as well. MN 25 and MN 31 have 6 forward and 1 reverse syncromesh transmissions while the MN 40 and the MN 49 have 9 forward and 1 reverse sycromesh transmissions. The frame is mostly made of steel, but can be made (whole or in part) of aluminium for a lighter weight. A tow bar may be found attached at one or both ends, but heavy trucks mostly make use of a fifth wheel hitch. A truck frame consists of two parallel boxed (tubular) or C-shaped rails, or beams, held together by cross-members. It is very interesting to find out the details of a truck’s inner workings. We hope that you know your truck better now.